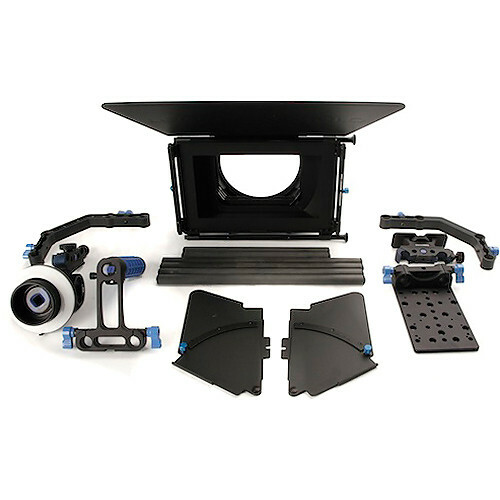 The Redrock Micro Universal Studio Bundle With microFollowFocus consists of HDSLR accessories that can be used to build a DSLR Cinema Bundle or to augment DSLR Slider Bundles for professional-quality movie recording. The bundle includes a DSLR tripod platform, DSLR baseplate, microMatteBox Deluxe Bundle, microFollowFocus, microHandle, microFollowFocus, 15mm support arm, 2 pairs of 12" (30.48 cm) long 15mm rods and a pair of 9" (22.86 cm) long 15mm rods. As modular components, the accessories help you create new, or reconfigure standard, rigs depending on the specific requirement of a shot or even to suit your shooting style. You can use additional cinema accessories to expand the Universal Studio Bundle for supporting video camera rigs. Box Dimensions (LxWxH) 18.0 x 15.0 x 8.0"